How to use passive mode with a router ? Wing FTP Server can be used in conjunction with a DSL router or cable modem by making a few adjustments in both the router/modem and Wing Ftp Server. The router needs to be reconfigured so that any inbound FTP traffic will be routed (or forwarded) to Wing FTP Server. Suppose you have a DSL router or cable modem directly connected to the internet with a static IP address, which for our demonstration purpose is 65.128.123.3. You have one or more computers plugged into the router, and with an internal IP addressing scheme, typically based on 192.x.x.x. In our scenario, our internal LAN is based on 192.168.x.x and server computer has an IP address of 192.168.1.123. When outside users connect to Wing FTP Server, they need to configure their FTP client to point to 65.128.123.3, which is the IP address of the router. The router will monitor incoming FTP traffics and forward (route) that request over to the Wing FTP Server on IP address 192.168.1.123. Wing FTP Server will process the request, send the reply back to the router, which will then forward the information back to the FTP client. The following steps will guide you in configuring Wing FTP Server to work with your router. In the first step, you need to know the External IP address of the router. In this demonstration, we use 65.128.123.3. If you don't know your External IP address or have a dynamic External IP address, you can get it from a web page for IP resolving(such as "http://ip.wftpserver.com/w/getIP.php"). 1. Log in Wing FTP Server Administrator Page. 3. In the tab pane of the FTP Pasv Mode, set the Passive Port Range values between 10,000 and 10,500. You can choose any number between 1024 and 65535, but we recommend that you limit the range to as few ports as you need. When a user lists a directory or uploads/downloads a file from your server, Wing FTP Server will use a port. Once the file transfer has completed, the port goes back to the available list for reuse. So if you only expect 10 people to download/upload files at the same time, you can limit your port range to about 20 or 30 ports. If you expect 100 simultaneous users, then 200-300 ports are recommended. 4. Enter the External IP address of your router in the field labeled Fixed IP.If you don't know your External IP or have a dynamic External IP, you can get it from a web page for IP resolving. 5. Click on the OK button to save the changes. 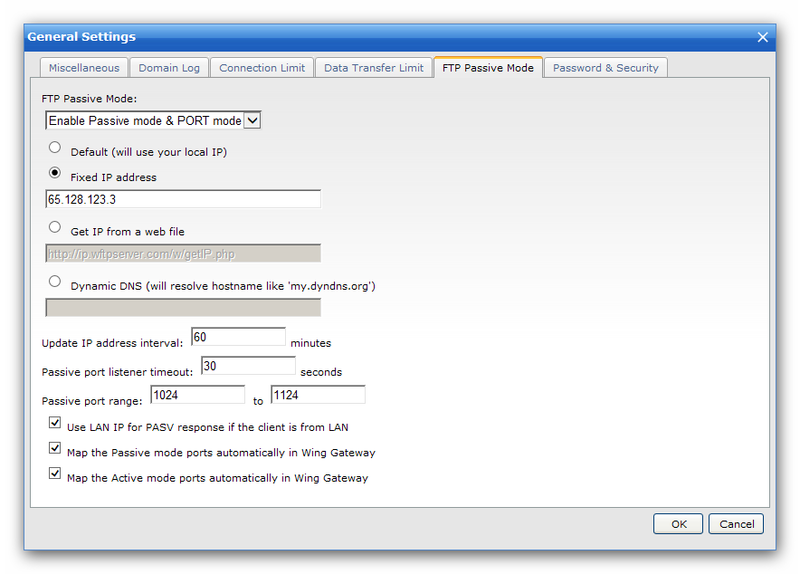 The following steps will configure your router to work with Wing FTP Server. Our test scenario was based on a LinkSys router, other routers may not have the same process. Please refer to the user’s Manual of your router for instructions on configuring Port Forwarding features. To continue this step, you need to know the Internal LAN IP address of the Wing FTP Server. In our scenario, we use 192.168.1.123. 1. Launch the configuration program for your router. The configuration page for the demonstration router is web-based. 2. 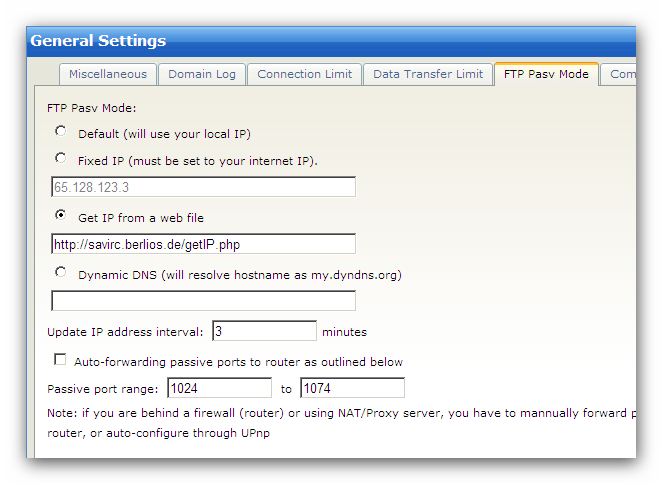 Configure the Port Forwarding feature of your router. 3. Forward Port 21 to your Wing FTP Server at IP 192.168.1.123. 4. Also forward the PASV Port Range specified in Step 1 to 192.168.1.123. This is necessary so that when the FTP client issues a PASV mode command to Wing FTP Server, the server will open a data channel for the client. 5. If you have Implicit SSL enabled on your Wing FTP Server, you may also want to forward Port 990 to 192.168.1.123. 6. Save the configuration and reboot your router. For some routers, you may need to switch off the power and restart again.